April 15, 2019–In a Trauma Surgery and Acute Care Open (TSACO) article published online this month, NTI researchers describe their methodology employing GIS technology to estimate total time and distance to care via ground and helicopter emergency medical services for 3,000 prehospital trauma deaths. The methodology calculates total prehospital time and distance using GPS coordinates, physical addresses, road intersections or highway markers for ground emergency medical service (GEMS) depots, helicopter emergency medical service (HEMS) helipads, injury locations and designated trauma centers. Response and transport estimates are computed using a GIS-based network analysis. 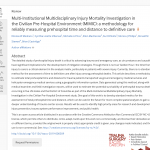 This data is being used in a study currently underway: the Multi-Institutional Multidisciplinary Injury Mortality Investigation in the Civilian Pre-Hospital Environment (MIMIC). Combining GIS data with medical examiner and field investigation reports, reviewers are estimating the potential survivability of prehospital trauma deaths that occurred in five U.S. states and the District of Columbia. To date, a group of trauma surgeons, neurosurgeons, orthopedic surgeons, forensic pathologist/medical examiners, and emergency medical service (EMS) personnel has examined 340 cases out of the total 3,000 included in the study. The results of the study will reveal high priority research areas in injury prevention, trauma system performance improvement, and public health. Already, opportunities for improving data linkages within the EMS system were discovered during the data collection process. In addition, the standard metrics developed here to assess total prehospital time and distance can be used for future studies that include more complex spatial analyses to gain better understanding of trauma center access. This work is supported by the Office of the Assistant Secretary of Defense for Health Affairs through the Defense Medical Research and Development Program under Award No. W81XWH-17-2-0010. The U.S. Army Medical Research Acquisition Activity, 820 Chandler Street, Fort Detrick MD 21702-5014 is the awarding and administering acquisition office. Opinions, interpretations, conclusions and recommendations are those of the author and are not necessarily endorsed by the Department of Defense or the National Trauma Institute.